1. Cook pasta in plenty of lightly salted boiling water until al dente, following package instructions. Drain, rinse under cold running water and leave to cool. Cut tomatoes in half. Slice cucumbers in half lengthwise and slice thinly. 2. 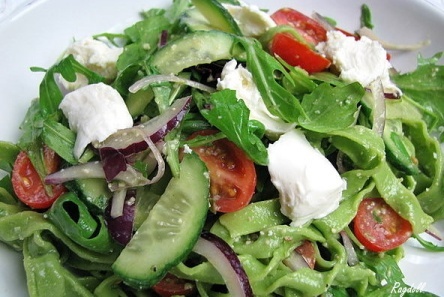 Combine tomatoes, cucumbers, rocket, onion and pasta in a large bowl. Drain bocconcini and mix into the salad. 3. To make basil pesto, clean leaves by wiping them with paper towel; do not wash. Combine basil, garlic, pine nuts and pecorino in a food processor and process finely. Combine oil, lemon juice and stock in a small bowl and add to mixture in a steady stream with the motor running until amalgamated. Add salt and pepper to taste. 4. Stir basil pesto into salad or serve separately. Spoon salad into individual bowls and garnish with olives.